On May 30, US Secretary of Defense Jim Mattis announced that the Pacific Command was being renamed as the Indo-Pacific Command. 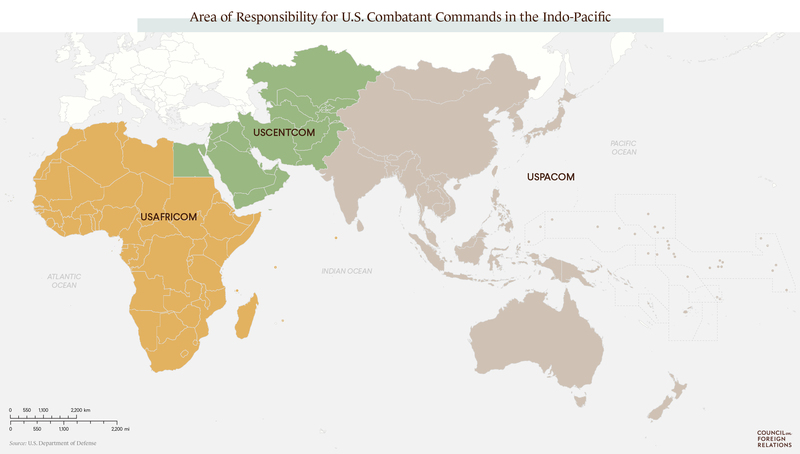 Thus the Pentagon’s largest (in a geographical sense) command has grown even more gigantic. The new designation is being introduced gradually, seeing as not many announcements have been made about the command’s reorganization, but in recent months this term has been used more and more often. Even Mattis himself has made a few “slips of the tongue” in his speeches about the region. But on May 21, Pentagon Spokesman Colonel Rob Manning mentioned the planned rebranding, claiming it being was done to better encapsulate the responsibilities the command currently has. The US media that specialize in the military have dismissed the idea that this rebranding has anything to do with the need to contain China and Iran. Although China has a coastline on the Pacific, Iran borders the Indian Ocean. But the more centralized decision-making will make it possible to react more quickly to any potential challenges or threats. So the Pentagon believes. And they have already begun to gradually translate their intentions (by suggesting that China and Iran are potential enemies) into reality. JOINT BASE PEARL HARBOR HICKAM (May 30, 2018)– Adm. Phil Davidson, commander of U.S. Pacific Command (USPACOM), is piped aboard during the USPACOM change of command ceremony. 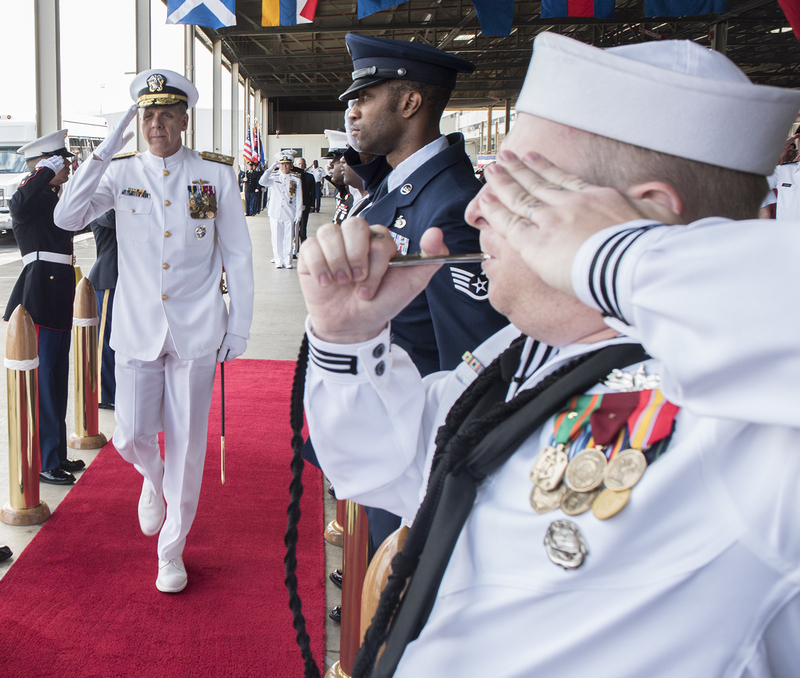 During the Ceremony, Davidson relieved Adm. Harry Harris as USPACOM commander. USPACOM is committed to enhancing stability in the Indo-Pacific region by promoting security cooperation, encouraging peaceful development, responding to contingencies, deterring aggression, and, when necessary, fighting to win. On May 23, the Pentagon announced that China will no longer take part in the Rim of the Pacific (RIMPAC) naval maneuvers that are held every other year in Hawaii under the direction of the US. The official excuse pointed to the exercises that the Chinese People’s Liberation Army (PLA) had conducted earlier in the South China Sea, during which China’s nuclear bombers landed on islands that are under dispute. Although anti-Chinese sentiments are nothing unusual among the American establishment (as are anti-Iranian, anti-Korean, and anti-Russian attitudes), as can be seen by the most recent doctrines on national security, national defense, and the assessment of the country’s nuclear forces, this name change nevertheless reflects more profound shifts (or intentions). A new name does not offer any advantages when it comes to equipment or military presence. Quite the contrary. Changing the symbols — from producing new shoulder sleeve insignia to replacing the signs that hang on doors — will in one way or another have an effect on expenditures that are unrelated to innovation or essential necessities. Rearranging the structure of the authority over organizational units within the military will also create additional bureaucratic headaches. What is behind this decision, other than anti-Chinese and anti-Iranian rhetoric? The first thing that leaps to mind is the close cooperation seen today between the US and India in that region. And it’s true that Washington has recently been paying more attention to New Delhi, describing it as one of the future poles of regional security there, along with Japan, Australia, and other allies. 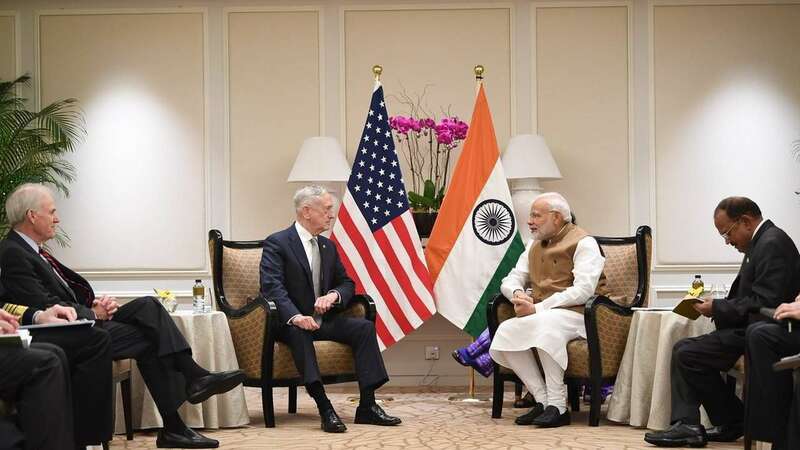 India’s Prime Minister Narendra Modi commented on the US command’s name change on June 3 at the Shangri-La Dialogue (SLD) conference in Singapore, noting that for India it seems quite natural to group the Indian and Pacific Oceans into a single geographical expanse. At the same summit, the news was released that the US, Australia, Japan, and India, which have joined to form the “Quad” group, will now view those two oceans as a new strategic domain. It is revealing that the joint American-Indian-Japanese Malabar naval exercises were held June 11-16 near the island of Guam. In an official statement, the US Navy claimed that the maneuvers were intended to emphasize war-fighting skills and to demonstrate maritime superiority and power projection. In view of the fact that Pakistan is rapidly emerging from the orbit of US influence, the Pentagon’s interest in India as a local base of operations is rapidly growing. And since India’s neighbors — Pakistan and China — themselves have certain territorial claims against that country (as it does against them), this factor is impacting the evolution of Indian-American relations. The US concept of a free and open Indo-Pacific strategy (FOIP) serves as an umbrella concept masking deeper intervention in the guise of large-scale cooperation. This strategy is simultaneously intended to both replace the failed Trans-Pacific Partnership on trade that Donald Trump rejected, as well as to lure ASEAN members over to the US side, or at least to ease them away from China’s expanding influence. But this is an on-the-spot approach, which suggests an attempt to develop a specific strategy. And deeper reasons also exist that have to do with the spinning of some kind of narrative based on a certain idea. The creation of imaginary images is an utterly intrinsic element of political geography (regardless of how well they actually mesh with reality), and those are then realized under a foreign policy agenda. This would be a good time to bring up the term “Near East,” which is now a universal designation for the group of countries that lie between the Mediterranean Sea, the Red Sea, and the Arabian Sea. But from whose perspective is it Near? And from whose perspective is it East? From the EU states it lies more to the southeast, for East Africa — to the north, and for India and China — toward the West. We owe the origin of that term to the Anglo-Saxon school of political science, or more precisely, to a long list of British diplomats, historians, politicians, intellectuals, and scholars: Thomas Taylor Meadows, Sir Henry Rawlinson, Sir Austen Henry Layard, David George Hogarth, Sir Henry Norman, William Miller, and Arnold Toynbee. Just like the term “Middle East,” this is the fruit of ruminating on the strategic communications of the British diplomat Thomas Edward Gordon and the American admiral Alfred Thayer Mahan, both of whom pointed out the connecting lines in the region. But those lines would hardly look so organic were it not for Great Britain’s colonial possessions — after all, they were the ones who needed a local administration, constant contact, control, and, if necessary, the use of military force there. Without the colonies, perhaps everything would be different and we would use the Arab self-designation of the Maghreb, the Mashriq, or other, more precise geographical terms, such as Western Asia. It is the same situation with the term Indo-Pacific — here we see an easily discernible expansionist model, albeit one masked in the guise of cooperation. Something similar has happened before. First of all, the concept of Atlanticism, which is understood to signify the unification of one part of ​the Old World with the US on the basis of a common history and shared values, ​​clearly demonstrates how intervention in European affairs can be justified — in the guise of rendering aid, offering protection from communism (the Cold War imperative), and creating a common system of security through NATO (what we do have is NATO as a punitive tool, but what we don’t have is a common security system, the evidence for which can be seen in the frequent terrorist attacks in Western Europe). Moreover, the emergence of the doctrine of Euro-Atlanticism as a byproduct of Atlanticism demonstrates how its clients are beginning to justify their positions independently, thus rejecting any potential criticism aimed at their patron. The second example is the framework model for the Asia-Pacific region. Although the US has had direct access to the Pacific Ocean for several centuries, America has not historically had an authentic presence in Asia. The scholarly, political concept of the Asia-Pacific region emerged on the scene in order to create a mental association. Along with US military bases and partnership agreements, and despite Washington’s negative role in the region’s 20th-century history (the nuclear bombing of Japanese cities, its involvement in the Korean War, the provocation in the Gulf of Tonkin that was followed by attacks on Vietnam, the support for various anti-communist movements, and its subversive activities against a number of countries), the American presence in the Pacific region of Asia has been transformed into a stable narrative. Now this region will become the Indo-Pacific. Although the US maritime presence is global, and every country in the world, in one way or another, falls under the responsibility of the various Pentagon commands, the official line justifying the US presence from the Horn of Africa to the Strait of Malacca will now be more assertive and direct. Unlike the actual history of that area that has been suffused with so many political, military, and strategic events, the Indo-Pacific expanse could become the subject of a long-view approach to historiography (a longue durée), to borrow the terminology of the French Annales School of historical writing. Perhaps US strategists even previously viewed it this way, but never spoke openly about it. Geopolitical analyst, Chief editor of Geopolitica.ru, founder and chief editor of Journal of Eurasian Affairs; head of the administration of International Eurasian Movement.